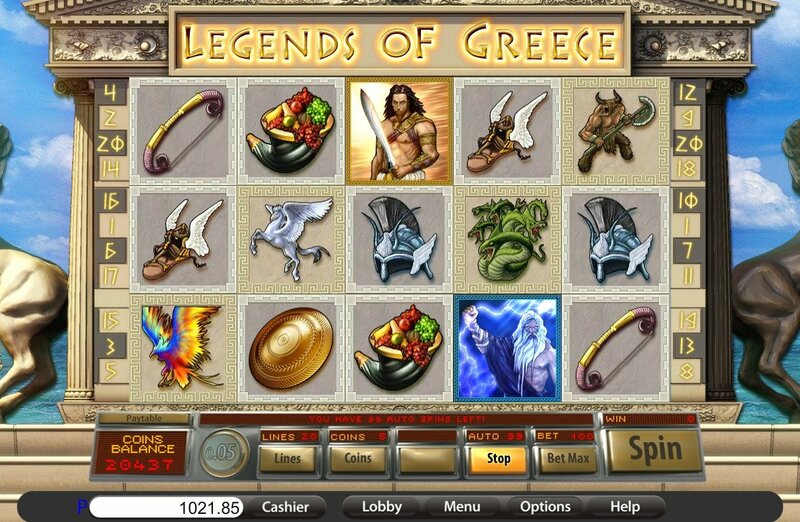 Legends of Greece slot machine is a quality production from BetOnSoft. Though it lacks a bonus game which I was highly anticipating, Legends of Greece provides players with good graphics, a great theme, and winnings that keep you interested with ever spin. Ancient Greece is one of the most studied and revered cultures that has ever existed. Why is that? It isn’t Alexander The Great who conquered what was then the entire known world. It isn’t the world’s first seeds of democracy or the military victories of the Spartans and Athenians that make up remember this civilization. It’s the heroes of myth and legend from Greece that fill our mind with wonder. Great legends like Hercules and Pericles have achieved the immortality that Achilles so fervently sought and now they have been brought back to life in BetOnSoft’s legends of Greece slot machine. 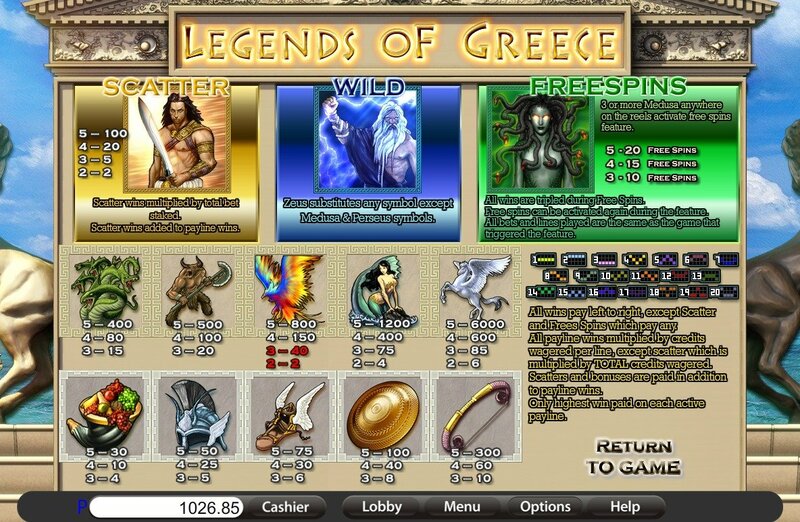 In accordance with other slot machines from BetOnSoft, Legends of Greece displays high quality graphics. Design is pleasant and intriguing and uniquely Greek. The pillared building on which the reels site is nicely shaded creating a proper 3D sort of feel while the blue sky and sea can’t be mistaken for any other body of water than the Mediterranean. The sound effects of the rolling slots are pleasant and not too overbearing while certain symbols and wins provide effects that properly reflect the power of the true legends of Greece. The sweeping pads in the background music of godly choir singers can only be described as heavenly. The sound effects of the rolling slots are pleasant and not too overbearing while certain symbols and wins provide effects that properly reflect the power of the true legends of Greece. The wild symbol of Zeus for example creates a rumbling, and crackling lighting sound of great power while the God of Olympus glows in anger. The symbols on the reels at Legends of Greece slot bonuses are also naturally reflective of the theme. With such mythical creatures as the Minotaur, the Hydra, and Pegasus, even the regular symbols are enough to put you into Ancient Greece. Special symbols however, include the great hero Perseus from whom you can win as much as 100 times your total bet. Zeus takes responsibility for the wild symbol with his fierce visage and crackling lightning bolts. 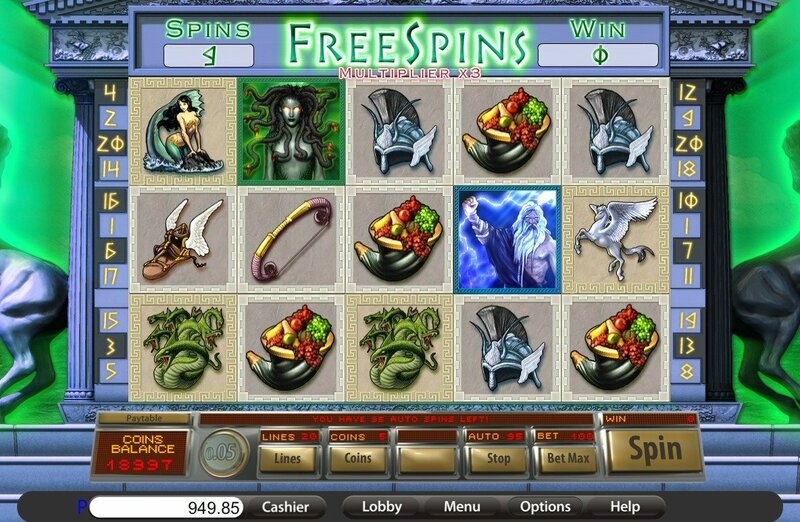 Finally, surviving the gaze of the monster Medusa earns you free spins during which as wins are tripled. Unfortunately, this otherwise enjoyable slot machine lacks a bonus game when there is very clearly great potential for one.